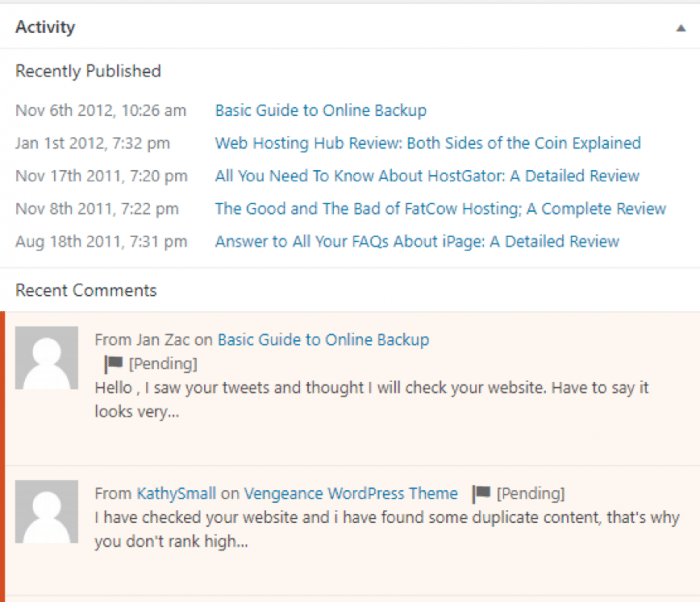 The WordPress Dashboard may look a bit overwhelming to the first-time blogger. With all the different menus or panels as I call them sub-panels (SubMenus), it can be hard to figure out where to get started. This quick little WordPress guide will help familiarize you with the WordPress dashboard. To login to the WordPress Dashboard – If your blog is set up in the root directory of your site the URL will be www.yourBlogURL/wp-admin, if your blog is in a subdirectory called a blog, for example, the URL will be www.YourWebsit.com/blog/wp-admin. 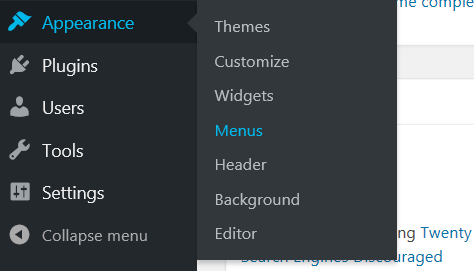 Within the WordPress dashboard, there are usually nine main menus or panels, clicking one of them will open a submenu or sub panel with more options. Keep in mind that the contents of some subpanels vary depending on the plugins you currently have installed and activated. We will dig a little deeper into some of the subpanels and discuss plugins later on so, for now, an overview. The main Dashboard has the recent activity on your blog, the latest information about WordPress and links to more documentation, plugins and themes. More options will be available on this page depending on the plugins and or theme installed. The Posts Menu is self-explanatory; you create and organize posts here alongside adding or editing categories and tags. The Pages Menu panel is for editing pages. From here you can see lists of all your pages and edit or view anything in those lists. Normally all pages created you add into the menu bar. See below for how to create a menu. The Appearance Menu can be used to add Themes, editing them etc.. you can also edit some your themes templates and other files used by your blog. This Panel is where you change the look of your blog. Here you can manage themes and add sidebar widgets if your current theme is “widget-ready”. Widgets will be covered in detail later. Older versions of WordPress will need the Sidebar Widgets plugin. Your WordPress blog should always be up-to-date because each update or minor security update patches security risks and improves some features that have been reported. You do not need any widget plugin, each theme installed adds custom widgets besides the default WordPress ones. If you are worried about updating your blog and running into problems, use our Upgrade Service and don’t worry about anything. The Tools Menu has some tools that are used to import content from various sources and export your blog. The Plugins panel is for activating and deactivating plugins. Plugins are used to extend the functionality of WordPress. The core of WordPress is designed to be lean, to maximize flexibility and minimize code bloat. Plugins offer custom functions and features so that each user can tailor their site to their specific needs. Plugins will be covered in more detail later. The Users panel is for adding and editing users that will be posting on your blog. Click the Users panel and then the Your Profile subpanel, make any changes and additions here you need to make and click Update Profile. You can also change your password within this subpanel. Click Settings menu. Check your settings in here and change what you want. The Tagline appears in the header of your blog, usually under the blog name. The Tagline should be a catchy phrase relevant to your blog, try to include your main keyword within your tagline. Make sure the URL’s are correct, and check or add your email address. When everything is correct, click Update Options. Dashboard has a multitude of modules. Different modules serve different purposes. As the name implies, at a glance provides a direct link to all your blog posts, pages, comments, spam and theme. Click on the page you wish to open and you will be directed to it. At the bottom, the count of comments and spam captured by Akismet (a spam catching plugin) will be visible. Quick draft is your instant means of writing a post and publishing it. Write a suitable title with content and you are done. You can save it as a draft and publish it later. Quick draft, however, can’t be used for either instant or scheduled publishing. Most recent drafts are displayed at the bottom. Activity provides you with an easy access to recent activity e.g. comments on your posts. You can reply, spam mark, approve/unapproved, and edit them using the activity log. Once you are comfortable with the WordPress dashboard you will find it isn’t as intimidating as it looks. If you have any questions about WordPress, please mention them in the comment section below.